The Boston Pride have signed their first goaltender this off-season. The signing is one that touches the NWHL Community as a whole, and most specifically the Pride organization and their fans. Recent Harvard University graduate Brianna Laing is now a member of “The Pack”, and will follow in the footsteps of her older sister. An original member of the NWHL’s Pride, forward Denna Laing suffered a severe spinal cord injury during the first professional outdoor women’s hockey game. The injury left her with limited movement in her arms and no feeling in her legs. Since that time, hockey players, coaches, fans and others from a variety of leagues, including the NHL, have rallied to show their support for the beloved player. But no show of support is bigger than having her sister defend the net for the very same hockey club. Hockey has been a big part of my life and my family’s life, so I’m proud to continue our legacy. Being able to play pro for the Pride – the team I always hoped to play for – is an amazing opportunity. It’s extra special because it’s also a way to honor Denna, whom I think about every day and is such an inspiration to me and so many other people. The first time I wear that Boston Pride jersey with ‘LAING’ on the back will be incredible. Laing’s four years with the Harvard Crimson saw her produce some spectacular numbers. In 35 games, she compiled a record of 22 wins, eight losses and one tie. More noteworthy is the fact that Laing assembled a .935 career save percentage, a 1.66 goals against average and a career win percentage of .726. 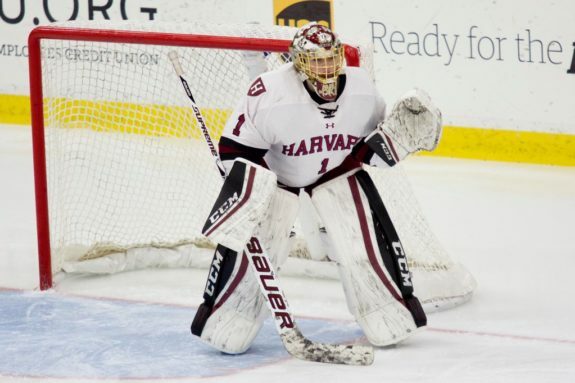 During Laing’s first two seasons with Harvard, the Crimson qualified for the NCAA Tournament. They lost in the first round to Wisconsin during her freshman campaign. However, in her sophomore year (2014-15) Laing helped backstop the team to the national championship. During that run, Laing and Harvard would eliminate Quinnipiac and Boston College in the quarterfinals and semifinals respectively. Unfortunately, the Crimson lost to the University of Minnesota in the championship game. On the international stage, Laing helped backstop the United States to a silver medal at the 2012 IIHF World Women’s U18 Championship hosted in the Czech Republic. In the tournament, Laing earned a greater portion of ice time between the two US goaltenders. She posted distinct wins with a preliminary 7-0 victory over Sweden and a semifinal 7-1 win over Germany. She also split duties with Sidney Peters in a 13-1 win over the Czech Republic in the prelims. The US fell short to Canada in the gold medal game. The Americans were shutout by their neighbors of the north, and Laing would stop 13 of 16 shots in the game. Aside from the outcome, Laing was on the ice with other current and former NWHL players at this tournament including Alex Carpenter, Cydney Roesler, Haley Skarupa, and Nicole Connery to name a few. Now in goal for @TheBostonPride: LAING. While the signing of Laing is an emotional one, the bottom line is that the Boston Pride have themselves an elite goaltender. Family and friends will most assuredly be proud, especially when they see ‘LAING’ emblazoned across the back of a Pride jersey once more. Meaningful as that moment will be, it is the goaltender underneath the jersey and behind the mask who has demonstrated an ability to be impenetrable. Another superb signing for the Pride.